Dental problems afflict up to 80% of cats after the age of three years. 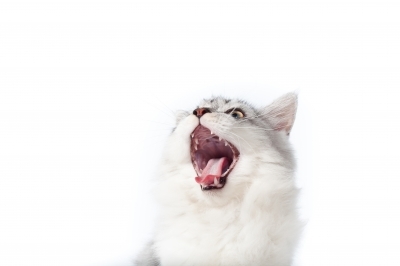 In addition to gum irritation and eventual tooth loss, bacteria trapped in teeth can enter a cat’s bloodstream, potentially causing heart or kidney disease. Contrary to popular belief, dental problems cannot be avoided simply by feeding a cat dry food exclusively. A cat’s teeth can be brushed or wiped using a toothbrush designed for human babies or a small pet toothbrush that attaches to your fingertip, which should be available at your local pet supply store. Never use human toothpaste with a cat. Instead, you should purchase a toothpaste specially designed for pets. These come in flavours such as chicken or malt that cats appreciate. Veterinarian Chris C. Pinney recommends choosing a toothpaste or gel that contains chlorhexidine, which continues to fight bacteria for up to 12 hours. Put some flavoured toothpaste on your finger and offer it to the cat to lick off. Do this a few times before you start the actual brushing (you can also let her lick some off the toothbrush so that she becomes accustomed to the brush texture). To make the activity seem less confrontational and prevent the cat from backing away from the toothbrush, hold her so that she is facing away from you when you first start brushing her teeth. The first few times you use the toothbrush, simply move the cat’s lips back and gently touch her teeth with it. Provide rewards (treats, catnip, affection, or playtime) directly afterward. Do this daily until the cat grows comfortable enough to tolerate proper brushing. Brush very gently, using small, circular motions, making sure to include the gumline (don’t brush the gums themselves). Brush just a couple of teeth at first and gradually increase the number of teeth brushed, praising the cat during the procedure. Always wash your hands before brushing your cat’s teeth so that you don’t introduce any bacteria to the cat’s mouth. Holding the brush at a 45 degree angle to the gumline makes brushing more effective. You don’t need to brush the insides of the teeth (the side closest to the tongue) because the tongue keeps them relatively free of plaque. You don’t need to rinse the cat’s mouth after brushing. When starting out, if using a brush that fits over your finger, be ready to remove your finger quickly if the cat panics and bites down. How Often Should You Brush a Cat’s Teeth? Veterinarian Holly Nash recommends that a cat’s teeth be brushed daily, or at least every other day. For cats that fight fiercely when tooth cleaning is attempted, there are other ways to maintain dental health. You can purchase a special oral hygiene gel, which uses bacteria-inhibiting enzymes to prevent the formation of plaque on teeth. These can either be fed to the cat directly or hidden in the cat’s food. There are also dental diets designed to scrape plaque while the cat eats. Always check with your veterinarian before using dental chews, gels or specialized foods. In the case of severe gingivitis and tooth decay, a veterinarian can remove teeth that have become loose and scrape tartar and plaque from remaining teeth using ultra-sonic vibration. Kittens do not need to have their teeth brushed, as they are unlikely to experience dental problems. However, it’s a good idea to touch your kitten’s teeth regularly with a clean toothbrush to get her used to the contact. This will ensure that as an adult, she will be less likely to fight the cleaning procedure. Nash, H., Veterinary Services Department, Drs. Foster & Smith (2011). “Brushing Teeth & Home Dental Care.” PetEducation.com. Pinney, C.C. (2000). The Illustrated Veterinary Guide, Second Edition. McGraw-Hill Professional Publishing. Purina. (n.d.). “Dental Care.” Purina.co.uk.